Have you ever wondered how much fun it would it be to be a treasure hunter? Are you interested in purchasing a kids metal detector, but there are just too many models to choose from? We are here to help you decide what metal detector is right for your child and tips for how to pick the right one. You can pick from the best 10 kids metal detectors for 2019 below. Getting them outside and on a real-life quest for treasure can be exciting and can lead to a lifelong hobby. The first thing that you will need to do is purchase a kids metal detector. Then you will be able to spend more quality time with your child, and they will also be learning without even knowing it. This metal detector is an entry level detector and is designed for young children. It is lightweight, sturdy, easy to use and has an adjustable arm. It features a simple display screen that lets the child know when they detect metal. The Bounty Hunter Junior kids metal detector is weatherproof, but it is not waterproof. If you plan on going to the beach or think that it might be accidentally submerged in a puddle you will want to purchase a detector that is waterproof. The Bounty Hunter Tracker IV is the next step up from the Junior. It has additional features that include a headphone jack, preset ground balance and 3 search modes. Only the search coil is waterproof. This model is a little more expensive than the Tracker IV and the Junior, but it is worth the extra money. It includes all of the features of the other two models and also has an LCD display, depth indicator and has 3 different tones. This is a very nice machine. It is lightweight and easy to use while being affordable. It is durable, so it can take the wear and tear that it is going to receive. This particular model has two different coil sizes to choose from. There is a 5.75” coil and an 8” coil. When taking into which coil size to choose, take into consideration the weight. The Fisher F-22 is a very nice beginner-level kids metal detector. It has extra features and capacities that allow the child to dive a little deeper into metal detecting without being completely overwhelmed. The detector does weigh around 4 lbs., so take into consideration the child that is going to be using it. It might be too heavy for younger children. Minelab is a highly respected name in the metal detecting field and many adults choose to use their equipment. The X-Terra 305 lives up to the Minelab name. They may cost a little more than other brands, but they are of high quality. The Minelab kids metal detector has several features. It may take longer to learn how to use, due to the fact that it doesn’t have a graphic ID target. The Garret Ace 150 is a very nice detector for the price. It is easy to use and doesn’t have any complicated settings. It is equipped with a headphone jack, tone identification and a coin depth indicator. This child metal detector is very similar to a professional metal detector. It has many features that will take some time to learn. The appearance is more colourful than adult metal detectors and more aimed at children. It has a waterproof search coil, but the control box is not waterproof. This metal detector will surely turn some heads. Its bright green appearance is fun for children. It is durable and can withstand abuse from a child. It is easy to use and only weighs 3 lbs. This machine is geared a little more to older children that already have experience in the metal detecting hobby. It is equipped with an LCD screen display and allows for discrimination. Where Can You Go Metal Detecting? When first getting your kids involved in metal detecting it is best to start in your own yard. This will give you a sense of how they will behave and if they are going to show a true interest in the hobby. Since children usually have a short attention span, you will also be able to take more breaks. Public parks are also a great place to go to. Play areas and swing sets are usually excellent areas to find lost treasures. If your child is able to find things quickly, it will help to keep their interest. The beach is another fun place to explore, but be sure that you have the right kids metal detector so it doesn’t get ruined. Not all metal detectors are waterproof. Young children are usually happy to find anything, while older children are on a mission to find objects of more significance and value. A simple kids metal detector is usually good enough for children under 8. Older children in the 8-12 age range are usually interested in finding coins. Teenagers want to find bigger treasures. They have a better understanding of how the metal detector works and can easily understand the more technical aspects and features of the higher end models. 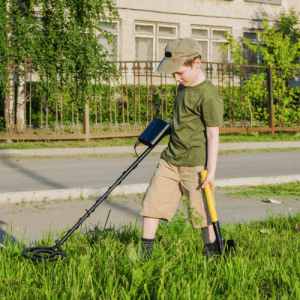 You might have thought that it was going to be a simple task, but picking the perfect kids metal detector can be quite confusing. There isn’t a one size fits all approach to purchasing a kids metal detector. There are several important features that need to be considered before you make your final decision. You want your child to have fun. Don’t take the fun out of it by purchasing a kids metal detector that is too advanced for their age. The machine also needs to be able to take the abuse that a child will give it. Teenagers and adults have a better understanding of high-end features, but younger children need something that’s easier to use. If the metal detector takes too long to set up and too hard to understand they are going to quickly lose interest and will not use it. Your child should be able to easily maneuver the kids metal detector. If it gets too heavy, they are going to tire easily and it will be too hard for them to use. The length of the kids metal detector is very important. You don’t want it to be too long where your child cannot handle it, yet again you don’t want it to short so that they have to bend over in an uncomfortable position. Purchasing a detector with an adjustable rod will help with ease of use and can be adjusted as they get older. There are different detectors for different ages. Manufacturers have performed a lot of research and have taken their findings into consideration when they design kids metal detectors. These units are sized proportionally and are able to withstand more abuse. If you plan on taking your child to the beach or around water, make sure the kids metal detector is water-proof. Most units are weatherproof, but this only means that they can handle a little rain and wet grass. Getting a unit that is not waterproof wet can void the warranty. If your child plans on searching for treasure underwater there are underwater metal detectors that were made for this specific purpose. A big factor in deciding what kids metal detector to purchase is your budget. There are many models available and the price ranges vary greatly. When starting off you don’t want to go too cheap or over the top. As we have mentioned you don’t need to purchase a kids metal detector that is too complicated to use, on the other hand, you do want a metal detector that works well and is durable. You want your investment to be a good one, and you want the detector to last so that your child can enjoy it and learn more about the hobby and find some buried treasures. The Tenetics Digital is designed with the same quality as a professional metal detector. It is marketed towards teenager, yet can be used by adults alike. It is a value priced piece of machinery that can be used for many years to come. The Teknetics Digitek is a kids metal detector for children 10 years old and up. This detector is great for finding coins, silver and gold. It is more advanced than some of the other detectors and includes a lot of the features that can be found on adult metal detectors. This childrens metal detector has a small learning curve since it is more advanced than the others. This metal detector is more colourful than a lot of other detectors and this makes them more appealing to children. Since they are appealing to children they will be more apt to use it and take care of it. The Teknetics Digitek kids metal detector has a waterproof coil. This will allow for searching in shallow water. However, the control box is not waterproof and can be easily damaged if it gets wet. It is able to detect coins up to 8” in depth and larger objects up to 2’ in depth. It requires 2 9V batteries. Minelab is a top-name brand that produces high-quality products. The X-Terra 305 model is a little more advanced than some other models, but if a child is serious about metal detecting they will appreciate the features that this model offers. This entry level kids metal detector is great for kids that are learning about the hobby. It is lightweight and easy to use. It is not overly complicated, yet is still great for metal detecting enthusiasts of all ages. The Minelab X-Terra 305 has two features that are exclusive to this model, the coil-dependent operating frequencies and the multi-tone audio targeting function. It also has pinpoint mode and a depth indicator. This model can find items that are buried up to 10” deep. It requires 4AA batteries to operate. This machine is a great affordable option for kids. It is very basic and is easy to learn and operate. It doesn’t have many of the higher-end features that are available on other models so there is a slight learning curve. This kids metal detector can be turned on and will work right away. For more control, there are 2 selection buttons for discrimination and depth control. The depth control has 3 options: shallow, medium and deep. It is lightweight and younger children will be able to handle it with ease. It has an adjustable arm. For small items the detector can search up to 8” deep, larger items can be detected up to 3’ deep. It requires 2 9V batteries to work. This kids metal detector is a great basic level entry level machine. It is adjustable in length and is lightweight. It is even a good machine for adults who are just getting into the hobby. The Bounty Hunter Tracker IV is a great metal detector for beginners. It is very user-friendly and has little to no learning curve. There aren’t any complex settings, and you can just turn the detector on and begin searching. It is a little heavier than some other models, so make sure that the weight is suitable for the child. It features an adjustable arm, so it can be more comfortable for the child to use. The Bounty Hunter Tracker IV is equipped with a headphone jack. It can be used either with or without headphones. This model does allow for sensitivity and discrimination and is very easy to set up. It can find small buried objects that are buried up to 8” in depth. It requires 2 9V batteries. The Fisher 22 is a kids metal detector that is of professional quality yet perfect for children. It has a small learning curve since it has extra features that allow children to learn more about the metal detecting hobby. It is also a little heavy and might be difficult for some children to maneuver. The Fisher 22 is an affordable kids metal detector that is also waterproof. It was not designed to work underwater, but it can be used in the rain. It is easy to use and has advanced features that some of the cheaper models do not have. It is able to find objects that are buried up to 9” underground. The depth of the object is displayed on the screen by the use of a notch. 1 notch is 3”, 2 notches is 6” and 3 notches is 6” plus. It requires 2 AA batteries to work. The detector has 10 levels of sensitivity, so it allows you to adjust it if you are getting too much feedback or if you aren’t having any luck finding anything at all. The American Hawks Explorer II is a very nice mid-level kids metal detector. It is cost friendly and easy to use. The American Hawks Explorer kids metal detector is a high-quality machine. It is heavier than other models, so make sure that the child will be able to handle the extra weight. It is very accurate and can even distinguish between a penny, nickel and a quarter. The 8” search coil is waterproof and can be submerged into shallow water. It requires two 9V batteries to work. It is a mid-level metal detector that is equipped with extra features that are not available on some cheaper models. Since it has these features, there will be a learning curve. These features will allow for more discriminatory and sensitivity searching. There is also a large LED display that will display the type of item that has been detected. The Tesoro Compadre is a high-performance kids metal detector that is a great choice for children as well as adults. This is a nice childrens metal detector, It was designed with the less is more approach. It is powerful, lightweight, easy to use and is able to locate metals without all the fancy knobs. It is equipped with all-metal and discrimination modes. There is only one dial, so there isn’t much confusion when using this product. The more you turn the knob the more trash you will be able to skip over. It is very lightweight which allows for children to have easy control over it. You can choose between the 8” or 5.75” search coil. They are both waterproof, but the control box is not. It only requires one 9V battery. This machine was designed with the less is more mentality. It is a great machine that can keep up with more complicated and expensive machines. The Garrett Ace 150 is very user-friendly and great for beginners. It comes with a handy DVD and book to help teach the basics of metal detecting. The Garret Ace 150 kids metal detector is an affordable beginner detector that is easy to use. It is a high-quality machine that doesn’t have complicated settings. Since this detector is easy to use children are more apt to use it without getting bored. There are only 3 buttons, so it isn’t too overwhelming. There is a power button, mode selector and sensitivity tuner. This metal detector is equipped with a headphone jack for those that would rather use headphones. It also allows for depth and discrimination control. It can locate items that are buried up to 8” in depth. It requires 4 AA batteries. 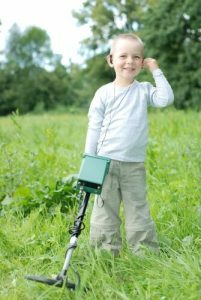 The Bounty Hunter Junior is a beginner kids metal detector model. I would recommend this detector for children 8 years and under. It is easy for them to maneuver and is lightweight and sturdy. It also features an adjustable arm. You can find detectors that are cheaper, but this one will actually find treasures. There are several other models available, but they are of poor quality. If you are planning on investing in a beginner metal detector, you will want to purchase one that is of high quality that will actually work. To keep children interested in the hobby they need to be able to find something. Children can be easily distracted and will quickly put down the detector and find something else to do. This childrens metal detector can detect small coin-size objects up to 5” underground and large objects up to 3’ underground. It requires 2 9V batteries. The Ground EFX MC1 Youth is easy to use and is visually appealing to children. It’s lightweight and sturdy. The Ground EFX MC1 Youth metal detector stand out in the crowd. Its appearance is striking and will turn heads. It is also very reasonably priced and will get kids out and active. It features an adjustable volume control and iron eliminator. The beeping and visual target indicator will allow the child to know that they have found something. It is lightweight and very easy to maneuver. It is adjustable in length and measures between 24” to 36” in length. It requires 2 9V batteries.